Sheriffs said there have been dozens of reports of looting and warned trespassers to stay out of declared disaster areas. 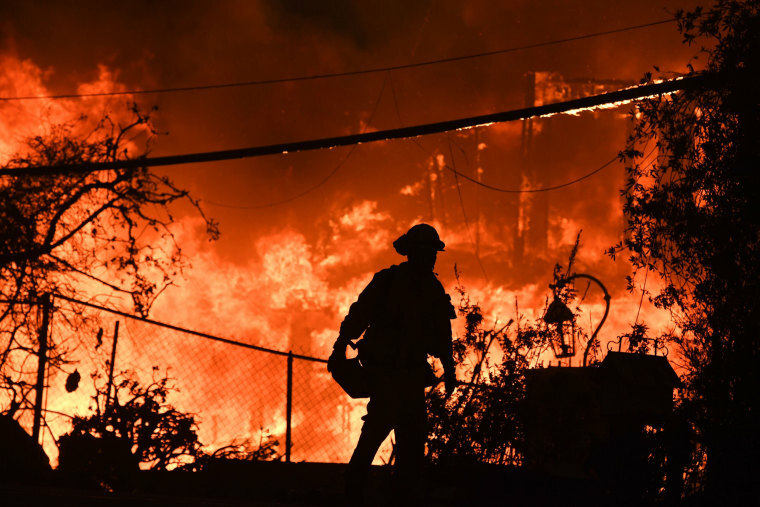 As firefighters in California continue to battle raging wildfires across multiple counties, deputies are trying to crack down on looting after two arrests were made over the weekend. The Ventura County Sheriff's Office said in a press release on Monday that it was sending out teams of law enforcement officers from Southern California to help handle looting in neighborhoods that have been evacuated. "We have experienced some looting activity during the past two days. Southeastern Ventura County is within a declared disaster area. People need to stay out of the area to let public safety crews do their work," the sheriff's department said. "People found in areas where they do not belong will be contacted by law enforcement and may be arrested." Ventura County sheriff's Sgt. Eric Buschow warned possible looters that they will be arrested and jailed during a news conference on Saturday after the arrests of two people, NBC-affiliate WKYC 3 reported. In Butte County, Sheriff Kory Honea said during a news conference there have been dozens of reports of looting. Miranda Bowersox, a spokeswoman for the department, told The Sacramento Bee that there have been 53 reports of suspected looting in the county in three days, but no arrests have been made. “If we discover looting and evidence of looting, we will investigate and even if we don’t catch you there we will investigate to determine if we can identify you and make an arrest there,” Honea told the Bee. At least 31 people have been killed in the wildfires, making them the deadliest in state history.